If you’ve ever struggled to find the perfect gift for a friend or loved one, you’re not alone. Sometimes it can be so challenging to find just the right thing that people procrastinate and run out of time or wind up purchasing something impersonal, such as a gift card. Sound familiar? Thankfully, Hang-A-Pot has a solution for you! No matter the occasion, our hidden flower pot hanger is sure to be a well-received gift for any crafting, gardening, or decor enthusiast! Summer Break is Coming Up! Are you looking for just the right project to keep your kids busy during their Summer Break? Crafting with your kids may be just the thing you need to reconnect with them during their time off. Consider purchasing herb pots for your kids and decorating them together prior to planting your herbs. Aside from a fun family crafting project, your kids will also learn about healthy food and sustainability while exercising their creativity. Even better, with Hang-A-Pot, your children can display their completed projects on anything from wood to chain link fencing and watch their herbs grow! This is a gift that keeps on giving — keeping the herbs in your kitchen will allow you to conveniently add fresh herbs to your cooking anytime you desire! Do you know a mom who likes having flowers around, either fresh or silk, inside or outside her home? If so, a sure way to bring a smile to her face is to gift her with Hang-A-Pot! For new or young mothers, decorating with silk flowers is an easy, no-maintenance means of keeping some color around the house. Our hidden pot hanger allows them to do this quickly and easily, displaying flowers on any surface without wires, plant stands, or other intrusive items. 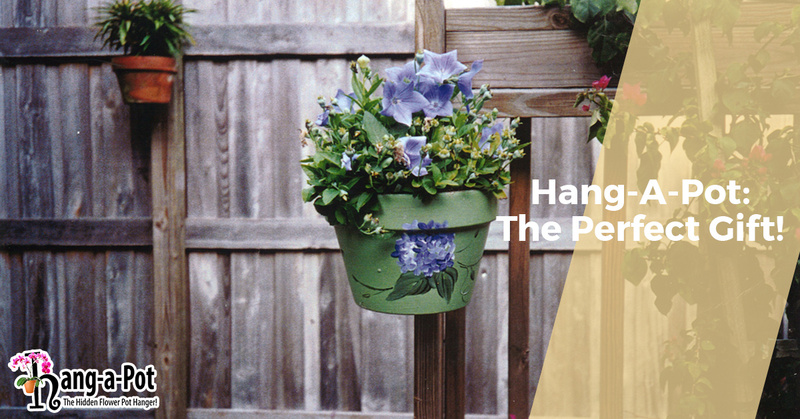 For elderly or retired mothers living somewhere with a small, dull patio area, Hang-A-Pot offers an ideal solution for jazzing up their exterior space. Another option is a Hang-A-Pot Flower and Orchid Pole — these poles are a unique gift idea and are sure to add creative beauty to any space. The decor ideas are endless with Hang-A-Pot! High School Grad Moving Out? It can be difficult to know just the right housewarming gift to give your child once they move out of the house on their own for the first time. Chances are, his or her new place will have blank and boring white walls that may need some sprucing up. With Hang-A-Pot, there are countless interior design and decor options! Additionally, Hang-A-Pot can be secured to a variety of surfaces so as to not damage the walls of your child’s rental property. For example, take a small piece of vinyl or wood lattice and attach a few pots to it with Hang-A-Pot and you’ve got instant bathroom storage for curling irons, hair dryers, washcloths, or toiletries. Apply this same principle in the kitchen and give your child the gift of organization for kitchen utensils. You can even paint the lattice and pots to match whatever style or color your child is decorating his or her new place with for continuity purposes. Installation is a breeze too! If you’re looking for just the right gift, think Hang-A-Pot and give the gift that allows your loved ones to display their plants and flowers in a creatively beautiful manner. It’s versatility makes Hang-A-Pot the perfect gift. Additionally, Hang-A-Pot is manufactured in the United States out of high-quality, durable polypropylene and comes with a lifetime guarantee! When you buy Hang-A-Pot, you’re buying a quality product that is sure to stand the test of time. Curious? Shop now!